Hermann Hesse (Switzerland, 1877-1962). 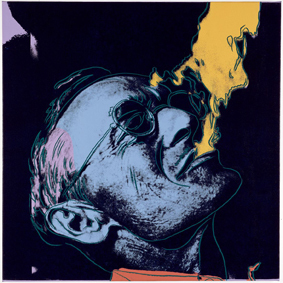 Image by Andy Warhol. A thirty-four-year-old poet, Viktor, comes back for a short visit to the little town of his birth and youth. Years ago, he had casually met a young woman, Theuda Neukomm; no word of love was exchanged, Theunda never knew of his feelings for her, but Viktor received from this short encounter a “parusia,” that is, a kind of spiritual vision or revelation. He made Theuda into an ideal picture and source of inspiration under the name Imago. Now, he learned that Theuda married a certain Director Wyss and had a child. He decided to inflict a symbolic punishment to the “unfaithful” one whom he calls Pseuda, in order to reestablish the original picture of Imago. Soon after his arrival, Viktor is invited to the meetings of Idealia, a local entertainment and benevolence society. Though he makes blunder and blunder he is invited in the family circle of Director Wyss. The latter asks him to write a poem for the annual feast of Idealia. A kind of acted fairy tale is played by disguised members of the group. When the man who was to play the part of the bear is called for an urgent matter Viktor is asked to replace him and he grumbled to the satisfaction of the audience. The highlight comes when Frau Wyss sings a poem to a big “Chrysalis,” the veils fall and the “butterfly” gets out: a young orphan girl, the Idealkind (ideal child), protected by the Idealia, and who now in turn recites a poem to her benefactors. From that moment on, Viktor realizes that he is desperately in love with Theuda, but he commits new blunders. Nevertheless, he is invited by the Wyss’s to the birthday of their little child. Theuda, in a white gown as a fairy queen, with two wings and a crown on the head, recites a poem; the enraptured Viktor sees her as a goddess. A few days later he throws himself on his knees before her and confesses his love. In order to help him out of this situation, she allows him to come every day and talk to her. Their talks gradually become more impersonal, until she once asks him when he will be leaving town. On a following visit, Theuda is not at home, Viktor is received by her husband kindly, but with unmistakable intimations. On the same evening, Viktor’s landlady, Frau Steinbach, a young widow, asks him angrily when he will cease to make a fool of himself. Viktor learns that every word he said to Theuda was repeated by her not only to her husband but to Frau Steinbach. Viktor feels as if he were “drowning in shame as a mouse in a chamber pot.” On the next day he leaves the town, without having ever noticed that Frau Steinbach was in love with him from the beginning. But now he has disentangled the true Imago from the real Theuda and the spurious Pseuda. The purified Imago will be to him a glowing source of inspiration for the rest of his life.